Democracy and Prosperity: The Inevitable Link? The question about the link between democracy and economic prosperity is key for scholars and policymakers alike, especially when it comes to transition economies. The Arab Spring brought the challenge of building democracies that deliver into a new, sharp focus and emphasized the need for sharing lessons learned from the experiences of others. In that spirit, Wrocław Global Forum, an annual summit organized by the Atlantic Council, the city of Wrocław, Poland, and other partners, hosted an international panel on this subject. While there is no simple, linear connection between democratization and economic growth, the key to realizing the link between the two lies in proper understanding of democracy. While democracy is often equated with elections, what happens between elections matters as much as voting. Do citizens have the right to information and free association? Are property rights protected and contracts enforced? Both well-functioning democracies and market economies require institutions that create transparency, hold those in power accountable, and enable broad participation in day-today policymaking. For MENA just like for Central Europe two decades ago, there are no quick ﬁxes: meaningful reforms take time. In the long run, successful reforms are about creating institutions that guard the principles of fairness, accountability, transparency, and responsibility in political and economic systems alike. Wrocław Global Forum brought together important decision-makers and business leaders from the United States and Europe to discuss the role of Central Europe as a strong partner in the transatlantic community and a leader on global values. Discussing the values that underpin democracies and market economies, and how transition countries have been working to implement those values, was an important part of the Forum. 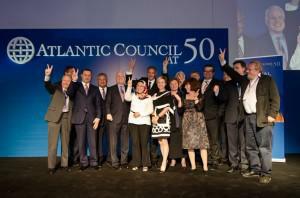 So was its culmination event: a ceremony honoring the recipients of this year’s Atlantic Council Freedom Awards meant to recognize individuals and organizations that defend and advance the cause of freedom around the world. The National Endowment of Democracy was among them, honored almost exactly 30 years after President Ronald Reagan’s speech at the Westminster Palace laid the foundation for creating the NED. You can watch on YouTube the session on democracy and prosperity as well as other WGF sessions.